This time, it's content from the Otis Historical Archives in Washington DC, which specializes in images from the history of public health and military medicine, but there are other themes too. 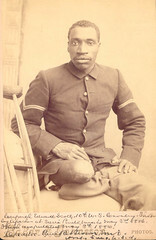 Image above is of "Buffalo Soldier" CPL Edward Scott of the 10th US Cavalry, injured 3 May 1886 at the Battle of Pinito Pass, Mexico (sent to chase down Geronimo and his men). These images (about 600 of them) aren't part of the Flickr Commons project yet, but apparently that's in the works; meanwhile, you can still browse and add comments. BUT WAIT, THERE'S MORE: Battlefield Biker has more of Corporal Scott's story, including this quote from a letter written by his rescuer, Lieutenant Powhatan Clarke: "The wounded Corporal [Scott] has had to have his leg cut off, the ball that shattered it lodging in the other instep. This man rode seven miles without a groan, remarking to the Captin that he had seen forty men in one fight in a worse fix than he was. Such have I found the colored soldier." MercuryRising and other blogs have the story of Thomas Warziniack, and how officials didn't expend the very minimal effort that would have protected his rights as a US citizen. Warziniack was born in Minnesota and grew up in Georgia. Although family members have produced Warziniack's Minnesota birth certificate, Immigration and Customs Enforcement (ICE) officials have been holding him in an Arizona detention facility pending deportation--because, they say, Warziniack claimed to be a Russian citizen upon arrest for minor drug charges. Warziniack has a Southern accent, does not speak Russian, and has never been to Russia. He is a former heroin addict who may experience mental illness, and he has no memory of making such claims. But "the immigration agents told me they never make mistakes," explained Warziniack. "Proving citizenship is especially difficult for the poor, mentally ill, disabled or anyone who has trouble getting a copy of his or her birth certificate while behind bars," notes reporter Marisa Taylor. And because of such cases, immigration and citizenship are disability issues. Disability Blog Carnival #30 is up now! "disability is not a one-size-fits-all experience"
"I am the expert on my particular body"
"your words, or more importantly, your attitudes, have the ability to ruin my day"
"Do not touch, push, or otherwise handle assistive or mobility devices without permission"
"you were not hired to be my minister, my parent, or my buddy"
"blindness isn't a calamity unless the 'professionals' make it so"
"I will not accept the myth that my life is less important because there is less that I can do"
"My time is just as important as your time." Look! Up in the sky! It's a bird, it's a plane, it's.... the next Disability Blog Carnival edition, to be hosted by Emma at Wheelchair Princess (recently featured in a Guardian article about disabled bloggers at the Katie Thorpe case), on February 14th. The theme is.... "Superman." Hmmm! Deadline for submissions is February 11, at the blogcarnival.com form, or maybe slightly later if you go directly to Emma by email. I've mentioned the wondrous Bain Collection before here--it's a huge set of news photos from the 1910s, in the Library of Congress. There are a wide array of disability history images there, from General Dan Sickles to deaf schoolchildren dancing. UPDATE 1/21: Ah well. I've looked through the whole collection now, and I'm pretty sure they didn't include any of the Dan Sickles images, nor the deaf school children dancing, nor the disabled veterans boxing, in the Flickr set... but there are still some images there that I've tagged "disability" (if someone else didn't get there first). Boy, you ought to see me open a bottle of beer. Born on this date in 1914 in Nova Scotia, Harold Russell, pictured at right with the two Oscars he won in 1947 for a single role, in Best Years of Our Lives. Though he was Canadian-born and raised, he was living in the US and working as a meatcutter when Pearl Harbor was attacked in 1941; he joined the Army the very next day. While making a training film in 1944, a defective fuse blew up and both hands had to be amputated. He used hooks thereafter, with a grace that, by all accounts, dispelled dubious onlookers' concerns. Russell appeared in an Army documentary about rehabilitation, Diary of a Sergeant, while he was a student at Boston University. He was spotted by director William Wyler, and cast to play a disabled veteran in The Best Years of Our Lives. He won two Oscars for the role: one a "special" Oscar for "bringing hope and courage to his fellow veterans," and one for Best Supporting Actor, as voted by the Academy. After the hubbub surrounding his Oscar wins, Russell returned to Boston University and finished a degree in business. Russell published an autobiography, Victory in my Hands (1949). 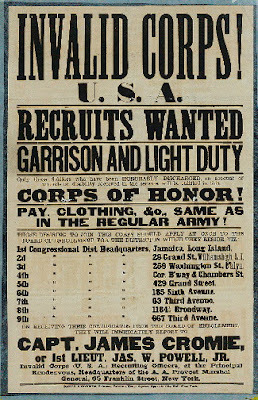 For many years he was National Commander of the American Veterans (AMVETS), and chaired the President's Commission on the Employment of the Handicapped. "I let Leo bring a book to my cousin's tedious wedding reception, so he'd at least be quiet and have a decent time. My cousin was annoyed with me, but whatever works, right?" "Okay, so I had to dress like a clown and sing a ridiculous song, but every kid in that class will remember what pi is, from here forward. So, whatever works!" Note that in these instances, the risk and embarrassment were undertaken by the adult--not inflicted by an adult on a child. Note that "whatever works" isn't used as an excuse for humiliating a child, abusing a child, or causing a child unnecessary pain of any kind. Because ends can't justify those means--no ends--not ever--not with any child. "Whatever works" is not a free pass to be hurtful, cruel, or insensitive to another's pain. Who raised, and who taught, the officials who believe otherwise? For Blogging against Aversives Day--click the link for many other bloggers on the subject. Our East Coast readers (or those willing to travel) will want to make plans to attend an exciting upcoming conference at Swarthmore College, Swarthmore, PA, on Deaf Studies from a global perspective. The conference kicks off Friday evening, February 29 [its leap year]. At the welcoming reception linguistics scholar Carol Padden will be speaking on “Sign Language Geography: Creation and Spread of Sign Languages Around the World.” The following morning, Gaurav Mathur will be looking at the underlying structure of signs, like grammer in spoken languages, drawing upon examples from around the world, including Australian, German and Japanese Sign Languages. An exceptionally broad range of topics and regions will be represented over the course of that Saturday, March 1, 2008. Teachers can receive Act 48 hours (CEU's) for attending and participating in the conference. ASL teachers may acquire Clock Hours for ASLTA. This conference is organized by the Linguistics Department at Swarthmore College and sponsored by the William J. Cooper Foundation. The entire program and directions to the campus can be found on the conference website. Brent Martin's brutal, pointless death --why don't we hear more about it? Bloggers are telling these stories to a wider audience when no one else will--please, keep telling the stories, keep them from falling through the net. Brent and Shane were human beings who deserve to be remembered and mourned, and nobody could deserve the treatment they got. Disability Blog Carnival #29 is up NOW! Connie Kuusisto is your host for this fine edition, posted at [with]tv, with the theme "Disability and the Media." In this case, media includes "legacy" formats like newspapers and television, but also new media like Flickr and YouTube. Check it out for takes on disability in Bollywood film, Amazon women, the Empowered Fe-Fes, poetry, Oprah, Dr. Phil, sport reporting, advertising, educational funding, you name it. We're back on the twice-a-month schedule in the new year, with the next edition (#30) scheduled for January 24, to be hosted at Ryn Tales, with the theme "What professionals should know." This is your chance to tell medical, educational, and other professionals how to serve YOU better. Submissions are welcome at the blogcarnival.com form, OR in emails to me or Ryn, OR in comments here or there--as usual, the host will consider all entries made up through Monday evening before the Thursday carnival posts. 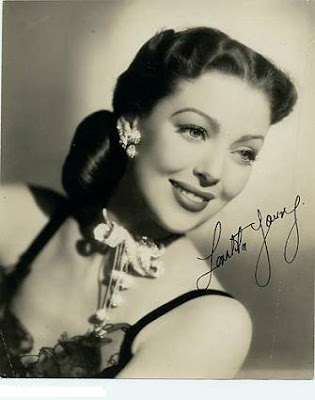 American actress Loretta Young (portrait at left) was born Gretchen Young 95 years ago today in Salt Lake City. She won an Oscar for Best Actress in 1947, for The Farmer's Daughter, and had a long-running anthology program on NBC in the 1950s. She remembered complaining to her mother that she couldn't tell the b's and the d's apart in her school readings; so the family had her vision checked, but there was little more support available in the 1910s and 1920s. By her early teens, she was tutored on movie sets, and not expected to study much. She recognized herself as having dyslexia when she first heard the word, after a career in which she memorized whole scenes to avoid reading unfamiliar text in front of others. She was one of the early celebrity readers to volunteer her time and voice for making audiobooks produced by Recording for the Blind -- now named Recording for the Blind and Dyslexic. This looks like a spectacular series. Registration is now open; they're also looking for local volunteers to help with set-up and such. Here (below) is the homepage blurb, but go check out the individual events scheduled--a nice mix of performing and visual arts, scholarship and storytelling formats, with a wide range of topics. Join The Unruly Salon to further the discourse on diversity, humanity and civil society; contribute to a fundamental reshaping of the disability narrative; challenge ideas of ‘global citizenship’; and work to realize the full inclusion of all people. In the context of a burgeoning disability arts and cultural movement in Canada and internationally, the Unruly Salon Series is an historical first at UBC. Drawing from both internationally renowned scholars of disability studies and professional artists from the visual, performing, musical arts’ sectors, the Salons will demonstrate a belief that the pursuit of equality and inclusion is a cultural task as much as it is an academic or political one. How do varied experiences of dis/ability transform and vitalize the meaning of an education, the public sphere and social justice? How can disability arts, culture and struggles by people with disabilities transform and inform undergraduate and graduate education at UBC and in the wider province, Pacific Rim and internationally? What can we all learn from artists and scholars with disabilities currently participating in disability scholarship and the arts locally and globally. The Series is the inspired creation of Dr. Leslie G. Roman, Associate Professor, Dept. of Educational Studies at the UBC Faculty of Education, in partnership with Mr. Geoff McMurchy, visionary artistic director of S4DAC (The Society for Disability Arts and Culture) and Artistic Director for The Unruly Salon Series. --Anne Stevenson, "On Going Deaf"
American-raised English poet Anne Stevenson turns 74 today. She was studying music in college, a cellist, when she started becoming deaf, and turned to literature. (Stevenson now uses a cochlear implant.) She's published eighteen volumes of poetry, a biography of Sylvia Plath, and two studies of Elizabeth Bishop's work. Some of Stevenson's poems, "What I Miss" and "Hearing with my Fingers" among them, are about music and deafness; she dispels the common misconception that deaf people only experience silence. "Silence I miss," she declares. Visit Anne Stevenson's website for more information. Angela Leighton, ed. Voyages over Voices: Critical Essays on Anne Stevenson (Liverpool University Press 2010).